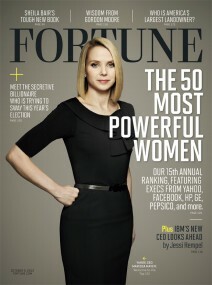 Fortune magazine put out its “50 Most Powerful Women in Business” list today, which was topped by IBM CEO Ginni Rometty. The nod to the leader of the longtime tech giant was followed by Hewlett-Packard CEO Meg Whitman at the No. 3 slot, Facebook COO Sheryl Sandberg at No. 8 and Oracle president and CFO Safra Catz at No. 10. But it was — shockeroo — media magnet Marissa Mayer who claimed the very elegant solo photo on the cover (though it is from last year), as well as the No. 14 slot. She is also the youngest woman on the list, at 37 years old. Mayer — the former Google exec whom Fortune correctly characterized as having been “somewhat marginalized” after 13 years at the search giant in its write-up — took over the troubled Yahoo in July. Since then, she has been making a series of dramatic cultural changes at the Silicon Valley Web icon as she preps for the more structural ones to come soon (and perhaps even before her first child is due in early October). Other tech stars on the list include Google SVP Susan Wojcicki and IBM SVP Bridget Van Kralingen. The most interesting part of the list, perhaps, is the fall of media giant Oprah Winfrey, who Fortune said “is the only woman with a spot on this list since its inception.” She is now in dead last at No. 50. Fortune also has its annual big conference coming up that is linked to the well-known list. It takes place in early October and is run by longtime editor-at-large Pattie Sellers, who is co-chair of the Fortune event, called the Most Powerful Women Summit.